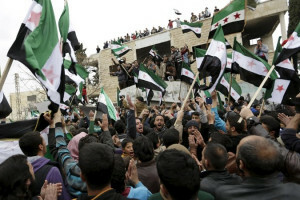 The French colonial green, white, and black banner of Syria adapted by the West’s proxy “Free Syrian Army” (FSA) had long been forgotten in the sea of black banners held aloft by Washington and Riyadh’s more extreme ploy to gain leverage upon and more direct access to the battlefield. However, as Syrian forces backed by its regional allies and Russian airpower overwhelm these forces while building alliances with other factions, including the Kurds, the West’s entire regime change enterprise faces ignominious collapse. For years, just looking at maps – including those produced by Washington-based think tanks themselves – revealed the true nature of Syria’s ongoing conflict. Forces could be seen flowing into the country as one would expect amid an invasion, not a “civil war.” While the West’s military campaigns over and upon Syrian soil claimed to be taking on the so-called “Islamic State” (ISIS), it was clear that nothing was being done about of “peace talks.”cutting off the obvious supply corridors sustaining ISIS’ fighting capacity. In other words, the US and its “coalition’s” war on ISIS was feigned. No genuine military campaign would ever be fought on the front lines while neglecting the enemy’s logistical lifelines – especially when those lifelines led from NATO territory. It wasn’t until Russia’s intervention on behalf of the Syrian government, that these corridors were targeted and disrupted – thus fully exposing the gambit for all the world to see. Not surprisingly, as soon as this began, it had an immediate effect on the West’s proxy forces across the country. Since then, Russian-backed Syrian forces have incrementally begun sealing off Syria’s borders, isolating stranded terrorist factions within the interior of the country, and retaking territory as these forces atrophy and dissipate. For years it has been asked why the West has done nothing about cutting these obvious supply corridors leading into Syria and sustaining terrorist factions like ISIS, Al Nusra, and their allies – groups which now clearly constitute the vast majority of militants fighting the Syrian government – even by the US government’s own admission. As the global public becomes increasingly aware of this glaring point of logic, it appears that the West is now attempting to cynically leverage it, while simultaneously rescuing thousands of trapped terrorist mercenaries facing encirclement and eradication in the closing phases of the Syrian conflict. Just last week, the “New Syrian Army,” a monkier for the discredited FSA, suddenly appeared on the Iraqi-Syrian border, “cutting off” ISIS supply lines leading back and forth between the two countries. Syrian rebel fighters seized a border crossing with Iraq from Islamic State on Friday, Britain-based war monitor the Syrian Observatory for Human Rights said. Islamic State had controlled the al-Tanf border crossing, which is also near the Syrian-Jordanian border, since May last year after seizing it from Syrian government forces. It had been the last border crossing with Iraq that was under the control of the Syrian government. The only “source” is the Syrian Observatory for Human Rights, which is in fact a single man living in England who regularly coordinates with the British Foreign Ministry. 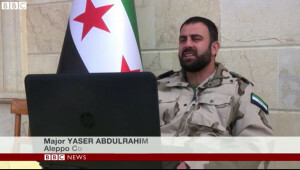 One could ask why such border interdiction operations haven’t been done before, and in fact, why these “rebels” who are admittedly harbored, trained, funded, and armed in Jordan and Turkey to begin with, didn’t first begin by securing Syria’s borders to prevent ISIS from entering the country in precisely the same areas “rebels” are supposedly operating? The answer is simple. The West had no intention of stopping ISIS. In fact, ISIS is the “rebels” and the “rebels” are ISIS. Their “taking” of the Syrian-Iraqi border is superficial at best. The weapons, cash, and fighters will still flow, just as they do past NATO forces along the Turkish-Syrian border. 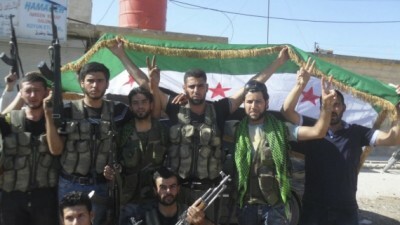 The only difference is that now these terrorists will be flying the “FSA” flag, lending them protection amid a ceasefire agreed to in good faith by the Syrian government and its allies. The ceasefire has, at least temporarily, bought time for terrorists groups Syria and Russia have – perhaps mistakenly – recognized as militant groups to be negotiated with. Taking full advantage of this, the “FSA” is now suddenly appearing as if rising from the dead, everywhere ISIS and Al Qaeda have dominated for years. 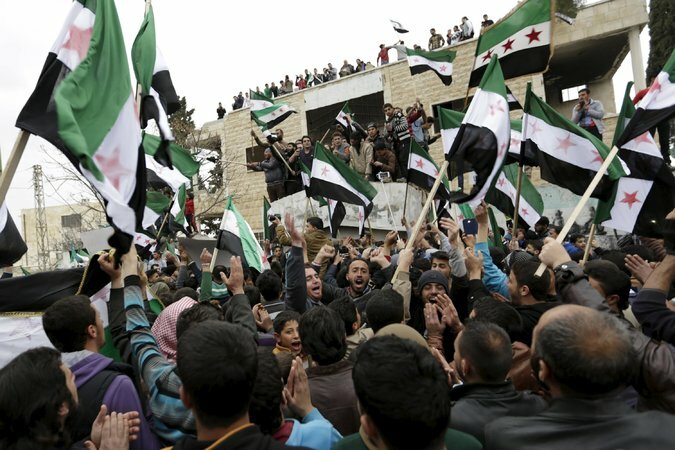 The New York Times published its own desperate bid to convince the global public that once again “pro-democracy protesters” were climbing out of the rubble in Idlib and Aleppo – two cities admittedly overrun by Al Qaeda and ISIS long ago – and flying the “FSA” flag. Street protests erupted across insurgent-held areas of Syria on Friday, as demonstrators took advantage of the relative lull in airstrikes during a partial truce, coming out in the largest numbers in years to declare that even after five punishing years of war they still wanted political change. Under the slogan “The Revolution Continues,” demonstrators waved the green, white and black pre-Baathist flag adopted during the early, largely peaceful stages of the revolt, before the proliferation of armed Islamist factions with black jihadist banners. Five years on from the so-called “Arab Spring,” the fully engineered nature of the original protests in 2011 have been so thoroughly exposed and understood by the public, that few if anyone believes these protests now are anything but a desperately staged public-relations campaign to prove that there are people elsewhere besides Washington, Langley, London, and Brussels, that still seeks regime change in Syria. The West’s terrorist proxies are changing from a war-footing – having lost the war – to a last-ditch posture of claiming legitimate opposition in hopes of salvaging what’s left of the political networks and terrorist fronts that collaborated with the West in this highly destructive conspiracy. Finally, in the very heart of the West’s proxy terrorist forces, Al Raqqa – the defacto capital of ISIS – there are suddenly reports of “uprisings” by the local population. This happens conveniently as the Syrian Arab Army approaches from the west and Kurds descend upon the city from the northeast. Faced with a cash shortage in its self-declared caliphate, the Islamic State of Iraq and the Levant has slashed salaries, asked Raqqa residents to pay utility bills in black market American dollars, and is now releasing detainees for a price of $500 a person. While the Telegraph credits “coalition airstrikes” for this turn of fortune, it is quite obvious that Syrian and Russian airstrikes along the Turkish border destroying entire convoys bound for ISIS territory has led to a reduction in ISIS’ fighting capacity as well as its ability to administer seized territory. With a terrorist force the West has spent 5 years and untold billions creating facing complete encirclement and eradication, what options are left? An “uprising” where suddenly the entire city is flying “FSA” flags, thus negating the need for Syrian or Kurdish forces to move in and retake the city? The BBC had dressed up a terrorist commander in FSA regalia for an interview – but included footage of the commander in the field operating under clearly terrorist banners. It was but an individual example of what it appears the West is doing now on a much larger scale – playing dress-up to save its immense but now stranded terrorist hordes. Will the West expect Syria and its allies to negotiate with this phantom army operating under a fictional banner? For Syria and its allies, what the West is doing is a clear violation of the spirit of the ceasefire and of upcoming peace talks. It is also a reaffirmation of the West’s disingenuous commitment to fighting terrorism – clearly using it as a tool to fight its battles for it, to serve as a pretext for intervening when terrorism alone cannot achieve an objective, and then, when all else fails, covering up entire legions of terrorists so that they can live to fight another day. Tony Cartalucci is a Bangkok-based geopolitical researcher and writer, especially for the online magazine“New Eastern Outlook”.